What’s the youngest a person can be exposed to science in a meaningful way? Loyal readers will know that I’ve pondered this question before, especially since becoming a mother. 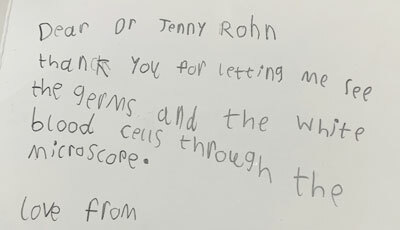 The other day a colleague told me that his four-year-old grand-daughter had expressed firm interest in “being a microbiologist when she grew up”, and could she and her mum come and visit me in my lab some day soon? Of course I agreed, though I wasn’t really expecting much. I duly arranged a risk assessment and permissions, and then asked one of my students to prepare some pretty slides that were at least visually striking, even if what they showed might be beyond the capacity of a four-year-old to grasp. When the day arrived, I was confronted with a firebrand of a little girl, eyes fiercely inquisitive. In lieu of a teddy, she was clutching two soft Giant Microbe toys, which she shyly held out to me for approval: a smallpox virion and a T4 bacteriophage. I revised my expectations considerably right there and then. My student was brilliant, explaining everything in a friendly and simple way as the girl was hoisted up onto the tall stool. It has to be said that at first that our pint-sized guest seemed a lot more interested in the swivelling mechanism of the stool, but eventually we managed to engage her with what was happening down the oculars: bright green bladder epithelial cells coated with a liberal sprinkle of neon-blue bacteria, and the wonky looking leukocytes that were coming to the rescue. As she and her mother took turns ooh-ing and ah-ing at the various slides, I got the impression that she was grasping at least the basic idea of cells under attack. I was quite surprised at the complexity of some of these, which I answered as best I could in a way that she was likely to understand. I didn’t ask, but I wondered what sort of content and education she had been exposed to elicit this list. 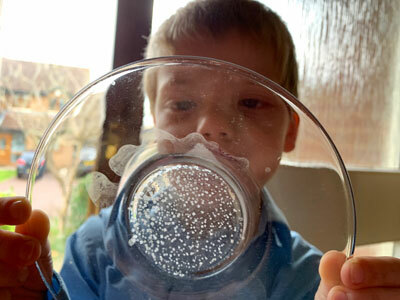 My own son, a year older, knows all about “mama’s germs”, but is very interested in the physical world and how it all works. I’ve told him about the water cycle on Earth, in which liquid from the seas evaporates into the air, forms clouds and eventually rains back down to start the cycle anew. The other day he asked me whether rain was salty like seawater. It was a good and understandable hypothesis, but I explained that salt was simply too heavy to float up into the clouds along with the water vapor. He seemed skeptical, so I decided that a little experiment was in order. I asked Joshua to dissolve a large amount of table salt into a cup of water. 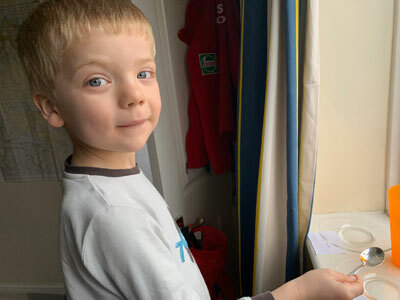 He then spooned the clear liquid onto a glass plate, which we put on the sunny windowsill of his bedroom. The control! How embarrassing to have to be reminded. And it made sense, as our tap water probably has some mineral content that might – literally – cloud the analysis. So we set up a second glass plate with plain water, labelled them, and left them for a few days. I warned him that it might not work – the most valuable science lesson of all, in my view. Fortunately, the experiment went off beautifully. Once dry, there were a few grainy smudges on the control plate, but the experimental plate was loaded with fat salt crystals, left behind for the big journey to the sky. Joshua was entranced. This experiment was dead easy to perform and understand, but I don’t think activities like this are being put on at school at his level. They’ve already done the vinegar and baking soda volcano, and have been asked to draw the solar system, but I wonder why they don’t get exposed to the art of posing a question and working out how to answer it. 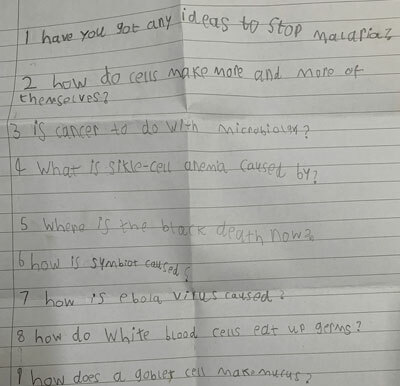 Because what could be a more effective lesson about science at this age, when asking how and why are so imperative? 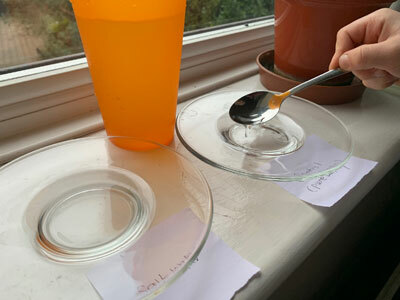 This entry was posted in Domestic bliss, Joshua, Scientific thinking, Students, Teaching. Bookmark the permalink. I went into my children’s school on two occasions to give a talk/demonstration etc in “Science Week”, once to my daughter’s year when she was 8, and last year I went in and spent half a day talking to each year separately. As well as trying to break the mindest of who can and can’t be a scientist with a “spot the scientist quiz” using snapshots of scientists scattered amongst other people to indicate that not all the old white guys were scientists, but that anyone could be a scientist, I tried to explain that what makes a scientist is asking questions, and then not being content to not try and answer them, but predicting what you think might happen from what you already know, and then working out a way to test it. I then led them through Galileo’s leaning Tower of Pisa experiment using a tennis ball and a cricket ball as my two objects of similar size and shape but different mass. I asked them for predictions, then asked them how we could best test it, how many times we should do it, how we could ensure it was a fair test etc and get them to carry out the experiment. When we worked out that mass makes no difference, I asked them to do a “thought experiment” where two people jump out of a plane wearing a parachute, but one’s parachute doesn’t open. Who hits the ground first? When they all agree the poor chap who had no open parachute I ask them what was different between the two that made them fall at different speeds? It clearly isn’t their mass, we’ve proved that, so they usually work out it is their shape, and then I give them two pieces of A4 paper and ask them how we could use those to do an experiment and see if we are correct about shape and how it affects how fast things fall, which we then do (screwing one up and leaving the other flat). This in turn leads us to why is shape important (it catches the air) so what if we did the experiments somewhere which had no air, and I show them the Apollo 15 Hammer and feather drop on the moon, where both hammer and feather fall at the same rate as there is no air to catch the feather. I use these series of experiments and questions to try and help them realise that being a scientist isn’t KNOWING stuff, it is asking questions, finding ways to try and answer them, then using that new information to help us ask NEW questions! The 8 year olds were perfectly capable of understanding this, of making predictions based on what they already knew of the World, and in making new predictions when they got new information. Teachers are hard worked and at primary level have to be masters of all trades, but there are usually experiments like these, and like your salt water experiment that can be planned with children’s participation and carried out simply to show that knowledge doesn’t just come from Google/our phones, it can be earned ourselves, with a little thought and a bit of experimentation!